March 27-30 DEDHAM HALL, Dedham, Suffolk. Mixed-media painting course. Details from Dedham Hall 01206 323027 or their website. April 27-29 OLD BANK STUDIOS, Harwich, Essex. 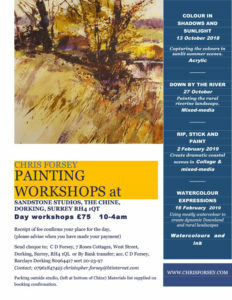 Workshops in Acrylic and Mixed-media painting. Details from Old Bank Studios 01255 242930 or their website. 10-14 May. ALPHA HOLIDAYS. Painting in Symonds Bath, North Devon. Details from Alpha holidays 01934 733877 or their website. June 1-9 PAINTING IN ITALY. Cortona, 1 week painting holiday in Tuscany. Details from Painting in Italy 044 7802 682575 or their website. July 13-20 DEDHAM HALL, Painting week. August 1-4 EAST DEVON ART, Sidmouth, Devon. 2 x 2 Day painting workshops. Details 01395 516284 or from their website. August 24 – September 7 L’AGE BASTON, Angouleme, France. 2x Painting weeks. Details from their website. 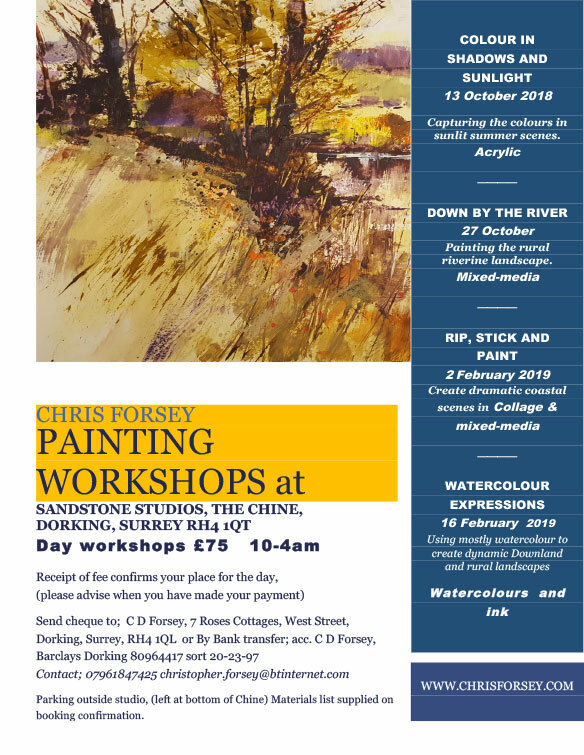 October 27 2018 “DOWN BY THE RIVER”, MIXED MEDIA, SANDSTONE STUDIOS, Dorking. February 2 2019. “RIP, STICK & PAINT”, MIXED MEDIA, SANDSTONE STUDIOS, Dorking. February 16 2019. “WATERCOLOUR EXPRESSIONS”, WATERCOLOURS & INKS, SANDSTONE STUDIOS, Dorking. To see booking details for all workshops, click on the poster to download a PDF. March 2-April 6, SOCIETY OF GRAPHIC FINE ARTISTS (SGFA) select members exhibition, Kevis House, Petworth. 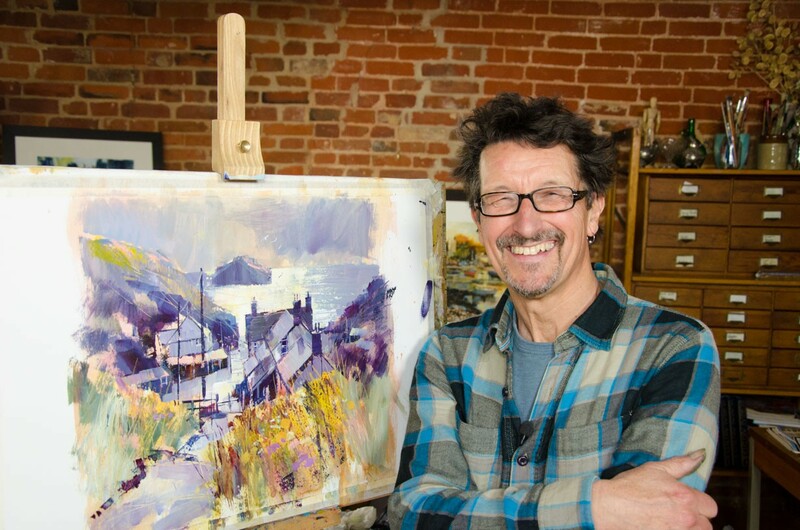 April 2-18 ROYAL INSTITUTE OF PAINTERS IN WATERCOLOURS (RI) Annual Exhibition . Mall Galleries, London. October 7-19 SOCIETY OF GRAPHIC FINE ARTISTS Annual Exhibition, Menier Gallery, 51 Southwark Street, London. I would be delighted for you to view paintings in stock in my studio. Please email, text or phone first to ensure that I am available.